I took a count of the number of brushes I currently own and have over 50. Now, as I was growing up and getting into makeup I was constantly purchasing new brushes as I tried to find what was right for me and how I like to apply my makeup. That’s how my collection became the size it is now. I’ve purged a lot of brushes since then too. Every once in a while I’ll pick up a new brush here and there as I feel like my skills improve or when I need a brush to do something specific. From all these brushes I’m sharing the five that I enjoy using the most and feel I reach for almost everytime I do my makeup. This brush is one of the oldest brushes I own and one of the first in my collection. When I first began building my collection I knew I wanted MAC brushes but couldn’t afford to just buy three or four large brushes at a time. Instead, I’d wait until they would release their holiday collection brushes and buy those sets. The handles were shorter but generally, the quality of the brushes were the same. I’ve used this brush for powder, blush and recently it has transitioned to my main bronzer brush. It’s extremely soft and fluffy which makes it good for dispersing product very lightly and evenly all over the face. I also like the shorter handle because it makes it much easier to grip and control. I shared this in a Tarte Boxing Day Sale Haul at the beginning of this year. I was so happy that a snagged the 5-piece brush set for only $21.00CAD! That’s less than the cost of one brush. All of these brushes are pretty great but the foundation brush has actually been the one I reach for the most. Since the brush is large it makes applying foundation super quick. 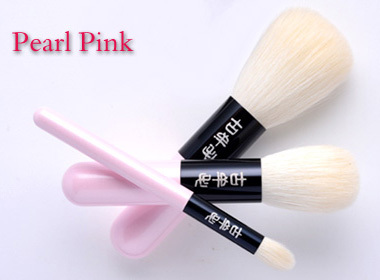 The brush is densely packed but extremely soft so it spreads my makeup evenly without leaving any streaks. I like this when I’m applying a light to medium coverage foundation because it really spreads it out nicely. I took a look at what they were offering this year as far as a brush collection, but I’m not sure I can recommend any of them. The closest this brush appears to be is to the Airbrush Finish Foundation Brush which is currently $44.00CAD – but if I know Tarte, it’ll be on sale soon enough at a price that is much less with a discount on top so keep an eye out for that if you were interested in buying one. This was part of a trio I received in my February 2017 BoxyCharm. The moment I got this brush I wanted to use it for concealer. Crown brushes are really affordable and nice brushes. I definitely think they are great if you want to start building a collection without spending too much money. This brush is dense and great for blending out concealer both under the eyes and over the lid when I want to use concealer as a base for eyeshadow. I find this way easier for me to use compared to a beauty blender. I just find that I can spread the product further with this compared to a sponge. Also, I don’t feel the need to wash my brush as often as I might a sponge. I know, maybe that’s not super hygienic, but I think this brush absorbs less product than my sponge does so I get more mileage out of it. This brush is newer to my eye brush collection. I bought this in an Inglot Haul back in October of 2017, but it’s my most favourite blending brush. It’s really large, so you could even use it as a highlighter brush. I like using it to diffuse my eyeshadow or when I’m building a light shade in my crease. This has really made blending out my eyeshadow super easy and it leaves it looking like I’ve been blending for hours! I also love it for one sweep eyeshadow looks because it’s so large. It makes it look like I’m a pro blender when it comes to eyeshadow. It’s a brush I was missing in my collection for a long time and I didn’t think I would use it as much as I do now but it really makes eyeshadow application (especially in the crease) so much easier. If you have large eyes or a large lid space like I do, I think you’d really enjoy a brush like this. Finally, we round it all up with another MAC brush and another blending brush! My collection is full of blending brushes because that’s what I think I struggled the most to get right as I was building my collection. I think I have about 10-15 blending brushes in different sizes and shapes because that’s where I spend the most time when I’m applying makeup. For me, this size brush fits perfectly in my crease and really helps blend colours there. I have considered purchasing multiples of this brush so I’d have some on hand for when I want to use multiple colours on my eyes, but the price of MAC brushes always holds me back. The brush hairs are long and have a medium density which is perfect for blending colours. It’s also a good size that I don’t feel like it spreads my eye makeup outside where I want it to be. If I could share ALL the brushes I love using, I’d have such a long post so I kept it to brushes that I find make makeup application the easiest for me and I use the most. There was a time when I was obsessed with brushes, even more so than makeup itself and I wanted to collect as many as I could because like I mentioned before I really struggled to find ones that were right for me. Has anyone else had that? How was it for you when building up your collection of brushes? Did you know what you were looking for or was it trial and error as it was for me? I’d love to know! Also, what are your fave brushes? Your MAC 129SE looks well loved! I like the shorter handle brushes too – not just for travel but better to get close to the mirror. I have that Inglot 4SS Large Blending Brush too and it’s really great to blend out transition shades. It’s not the softest brush out there but it blends like a champ. There’s not much love for Inglot brushes and I’m not sure why – they’re great and relatively more affordable. Inglot brushes are really good, I have some that are over 5 years old and they still hold up like they did when I first got them. I agree that they don’t get as much love as they should. I know your posts with the Japanese brushes haha! When they are good quality it’s not hard justifying the price. You can definitely find cheaper alternatives but sometimes it’s worth splurging. Have you gotten any more since your post?? I’d definitely want to learn more about them! They’re lovely and blend really well although I don’t reach for them as much as I thought. I think they’re more pretty than anything. I’m on the fence about this one – the bristles almost too fine so it gets gummed up with powder quickly. I think I have to find the right kind of powder to use it with. The Disney brush is so nice! I thought the Mickey print would be on the handle and not the actual bristles, much more impressive! I think for powder, I don’t mind if it’s not so soft as long as it does what you need it to do. Yes, multi-purpose brushes are the best. Sometimes you start off using them for one thing and then switch to something else. I have some shader brushes but not as much as blending brushes. What are some of your favourite shader brushes? Thanks! It’s taken a while to really find good brushes!